British Columbia, Canada’s third-most populous province, began taxing carbon dioxide and other greenhouse-gas emissions from combustion of fossil fuels nearly seven and a half years ago, pursuant to the province’s Carbon Tax Act. The province-wide tax commenced on July 1, 2008 at a level of $10 (Canadian) per metric ton (“tonne”) of CO2 and increased by $5 per tonne in each of the next four years, reaching its current level, $30/tonne, in July 2012. The point of the tax is to reduce emissions of carbon dioxide and other greenhouse gases. It is therefore surprising that very little detailed quantitative analysis of the tax’s efficacy in reducing emissions has appeared to date. Answers haven’t been readily available to fundamental questions such as: Have British Columbia emissions of carbon dioxide and other greenhouse gas actually fallen? If they have, by how much? How have the reductions in BC emissions stacked up against the rest of Canada, which does not tax carbon emissions (save for modest taxes in Alberta and Quebec)? How does the recent trajectory of British Columbia emissions compare to that prior to the onset of the tax? Which sectors have shown the biggest, or the smallest, declines? The Carbon Tax Center searched for answers to these questions during 2015. Not finding definitive data, we set out to develop our own. 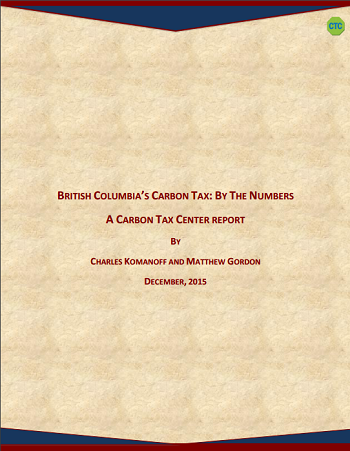 The result is a new report, British Columbia’s Carbon Tax: By the Numbers, which available here. A spreadsheet with supporting data is available here. Moreover, the BC tax is gaining adherents. On the eve of the Paris climate summit, in November 2015, Alberta Premier Rachel Notley committed to a similar carbon tax. Alberta’s tax will begin in 2017 at $20 per metric ton and rise in 2018 to $30, matching the current level in British Columbia. Although Canada’s two most populous provinces, Ontario and Quebec, are moving toward carbon cap-and-trade systems, the new Trudeau administration in Ottawa could choose to fashion a national carbon tax from British Columbia’s, with the possibility of higher tax levels to evoke larger emission reductions. British Columbia introduced a carbon tax in 2008. Since then, per capita emissions of carbon dioxide and other greenhouse gases covered by the tax have declined, continuing a downward trend that began in 2004. Averaged across the period with the tax (2008 through 2013; no data are available for 2014), province-wide per capita emissions from fossil fuel combustion covered by the tax were nearly 13 percent below the average in the pre-tax period under examination (2000-2007). The 12.9% decrease in British Columbia’s per capita emissions in 2008-2013 compared to 2000-2007 was three-and-a-half times as pronounced as the 3.7% per capita decline for the rest of Canada. This suggests that the carbon tax caused emissions in the province to be appreciably less than they would have been, without the carbon tax. The carbon tax does not appear to have impeded overall economic activity in British Columbia. Although GDP in British Columbia grew more slowly during 2008-2013, the period with the carbon tax, than in 2000-2007, the same was true for the rest of Canada. From 2008 to 2013, GDP growth in British Columbia slightly outpaced growth in the rest of the country, with a compound annual average of 1.55% per year in British Columbia, vs. 1.48% outside of the province. 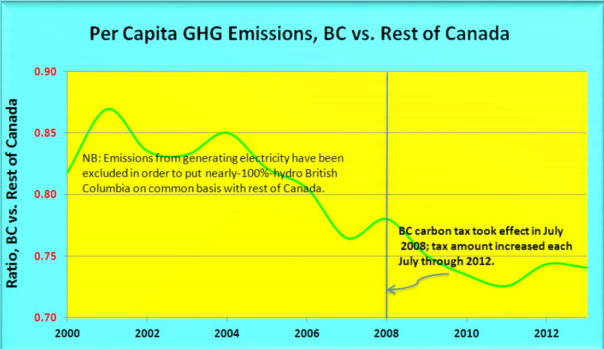 GHG emissions increased in British Columbia in 2012 and again in 2013, not just in absolute terms but also per capita. This suggests that the carbon tax needs to resume its annual increments (the last increase was in 2012; its bite has since been eroded by inflation) if emissions are to begin again their downward track. It is not hard to be first in a very limited field. 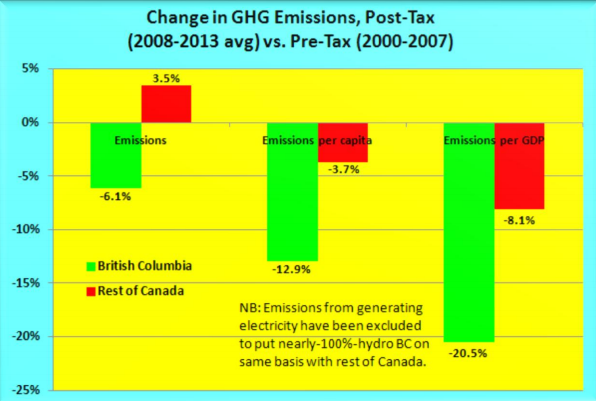 But the current version of BC’s carbon tax is not nearly as good as it was intended, or as it could be. First it was hobbled by the notion of “revenue neutral”: this is simply a way of pacifying the dogmatic right wing hatred of taxes, and the notion that government needs revenue to do Good Things. So the people were told that the money collected from them would be returned in lower taxation elsewhere. What was not made clear was that the reduction in taxation goes mostly to corporations. This does not feed through to the BC economy the way a cut in personal taxes would, because corporations have not increased spending in BC or even in increased dividends. They simply squirrel the money away – usually in an off shore tax haven. Secondly, instead of increasing the price of carbon each year, necessary to bring about a real shift in energy consumption, it has been frozen. This of course further reduces its effectiveness both in terms of fuel switching and better energy efficiency. It is of course pointless here for me to talk about the regressive nature of carbon tax, or the desperate need for increased spending in areas like child protection – which would save lives – or elder health care which would reduce suffering – or even public transit which would reduce GHG dramatically by shifting drivers out of the single occupant vehicles. With all due respect to Stephen Rees, while I do not disagree with the thrust of all of his conclusions, they might benefit from valid premises which now they lack. First, “revenue neutral” appears to be the key distinguishing trait of a working carbon price; where there is no fair return directly to citizens for what is after all sale of a share of the air in their lungs, we see like Australia total failure or like other programs far lower success at fossil emission reduction. Revenue neutrality, or recycling to owners of the air, is not pandering to the right wing nor is it born of tax hatred. The idea that addressing fossil emissions through Pigouvian taxes has effectively been disproven by the success of the BC Revenue Neutral Carbon Tax Act. It’s not the tax that make it work, it’s the fee-AND-DIVIDEND mechanism that works. While government may need revenue to do Good Works, all government revenue comes at a cost to the Economy, the source of all Good Works, and halters the Market, the seat of the sole judge of what is or is not Good Works, the recipients of those works and their providers. Mr. Rees wrongly says that recycling goes mainly to corporations. Revenue comes mainly through corporations, and mostly as costs they pass on to consumers (and often while bumping up prices they blame on the carbon tax but that go purely to excessive profit-taking), but as someone who has actually read every provincial budget since the carbon tax came out, I know that the majority or recycling goes to individuals, not corporations. It is true that the rate of returns to corporations has risen in the latter half of the program, but even so individual people remain the prime recipients. Mr. Rees conclusion, that corporations are having adverse responses to the BC Revenue Neutral Carbon Tax Act, are true. He badly miscasts the causes of this effect, and so we hope correcting him here helps him identify solutions. Finally, the BC Revenue Neutral Carbon Tax Act is not net regressive. Study after study confirm that the highest income earners are proportionately more affected by the revenue collection compared to lower income earners than any tax other than direct luxury-taxes that affect only the wealthy. Not merely not regressive, but more progressive than progressive taxation. Of course it is. Could it be better with regard regressive measures? Absolutely. If the revenues were treated like the Citizen’s Climate Lobby Fee & Dividend proposes or the Whitehouse & Schatz Bill, as true dividends paid directly to citizens per capita as equal shareholders, this would be far more progressive a measure. Were the rates to continue to rise, at double or triple or quadruple the old rate, it would be a better measure. Were the Law of Supply and Demand applied to set the rate, so the upper limit would be set where the next penny of increase would result in less net revenue, it would be a better measure by far. We have to stop the bandwagon jumping on climate change by people with an agenda. I get that you like your political views. I like mine. But politics must be forgot. As of 2015, the rate of global warming has begun to exceed 2.0 degrees Celsius per century and rising; we are committed to over 500 ppmv CO2 based on the most hopeful commitments of COP 21, well past 2.7 degrees of warming and guaranteeing the loss of most major world ports within the century, the loss of over 20% nutrient density in our food crops, 25% faster loss in soil fertility, and 40% gradient against absorbing nutrients to the web of life by aquatic species. Goofing around with “Good Things”? Since 2013 I have been looking at carbon tax and pipeline problems and recorded my findings on a blog, neilwilhees. On post 1 you will see how the Heritage foundation in the US and the Frazer institute in Canada ignored how the money flows back to taxpayers and published totally wrong figures claiming it hurts average households in the US and low income people here. In BC the opposite is true. The refund is based on average consumption. Low income people drive less and live in smaller or more crowded housing requiring less heating fuel per person. As a result they get more money back than they paid in carbon tax.